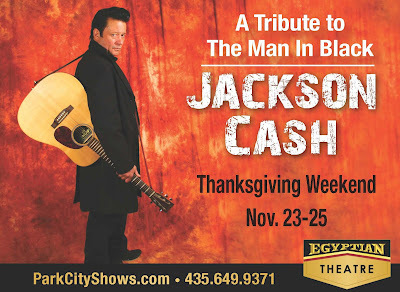 Jackson Cash-Tribute to The Man in Black. Fri-Sat-Sun. great for all ages, so bring the relatives and get out of the house for a great night of Johnny Cash music on Main St in Park City at the Egyptian Theatre. Cal Garner on bass, Randy Rudd on lead, and Taz on drums. Together, the sound, feel, and mood of a Johnny Cash concert is captured to perfection. This is a “don’t miss” show. He is the best Joanne Cash, Johnny Cash's sister has seen and heard. A show you do not want to miss. He will be selling his CD's, etc. and signing autographs after the show. I have seen him perform many times and is fantastic! I will be there friday!